We’re sharing some of the most popular baby boy nursery themes and pulling examples from our project gallery. While a theme isn’t necessary for a beautiful nursery design, many parents find it easier to design a nursery when thinking of a central theme. Many of these nursery themes for boys could also be used in a baby girl or gender-neutral room; shift your color scheme, furniture choices or accessories, and the room can sway to either gender. Super Hero Nursery Theme. We all know many older boys have an affinity for super heroes. Some parents like to encourage that love from the very start. We love a modern take on this theme. “Little Man” Nursery Theme. From mustaches to tie mobiles, the little man theme has taken the baby world by storm. Vehicle Nursery Theme. Trains, planes or automobiles—this theme is a long-time favorite for baby boys. Camping/Rustic Nursery Theme. Rustic touches and furry friends make camping-themed nurseries warm and cozy places for baby to rest. Nautical Nursery Theme. 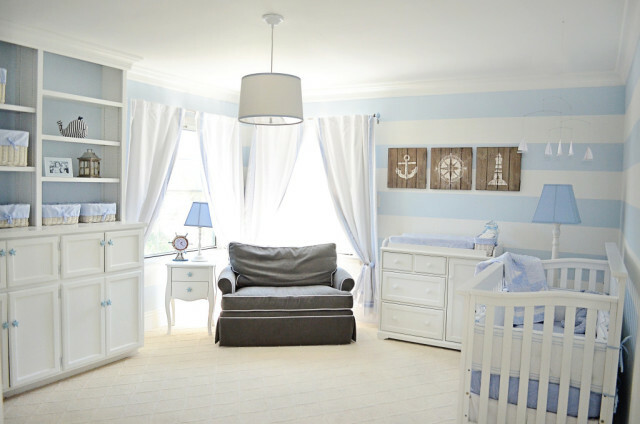 The nautical theme is a classic pick for a boy’s nursery. You can’t go wrong with this preppy mainstay. Safari Nursery Theme. Another nursery standby, the safari theme always makes a playful statement with lots of interesting animal friends to entertain baby. Beach/Surf Nursery Theme. Whether you live near the beach or you just want that beachy feel year-round, a beach-themed nursery is a cool and calming choice. Sports Nursery Theme. Another tried-and-true favorite for little boys, a sports theme can be one of the trickiest themes to incorporate while keeping a nice design sense. We love how the designers of the nursery below added elements of their favorite sports team, such as color scheme, without going over-the-top. Will you be using a theme for your baby’s room? Share it or other baby boy nursery ideas with us in the comments. It’s so lovely ! Great job ! Each and every single choice you made is perfect!